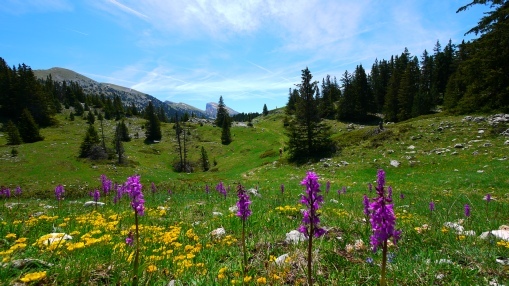 The traverse of the Vercors High Plateau has been described as one of the classic walks of Europe. The high plateau is a designated wilderness area that has been compared to the Canadian Rockies. 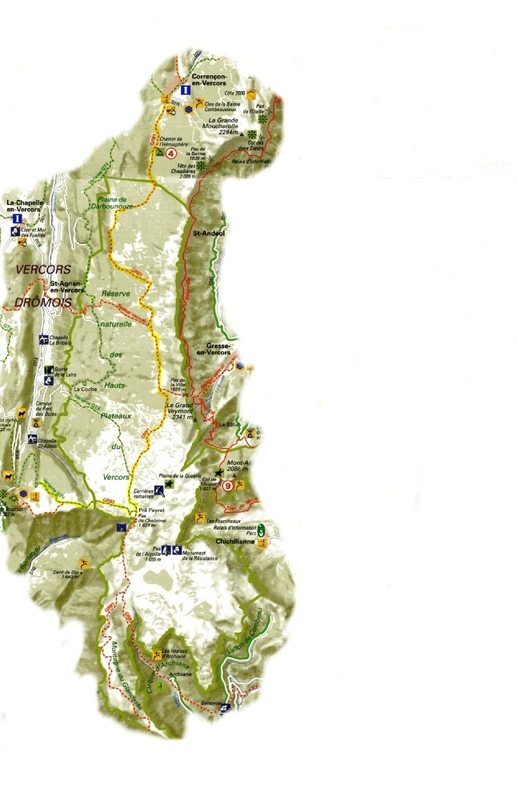 The multi day walk (usually tackled from north to south) begins at Correncon, follows GR91, and ends either at Col du Rousset or Die. 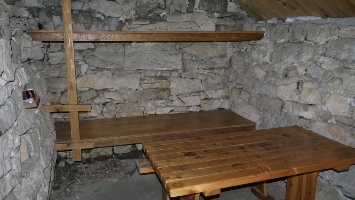 The walk should be timed to take advantage of the four refuges that are spread out along the route, although at some times of the year, the huts will be full (they are not manned and cannot be booked in advance). 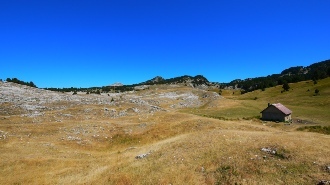 Whilst you will never be more than a few kilometres from civilisation, the natural barrier of the Vercors ridge (to the east) and the pine forests to the west, coupled with the lack of water and mobile ‘phone signal, emphasises the sense of remoteness the walk provides. The traverse should only be attempted by strong confident walkers familiar with a map and compass (and ideally GPS) who are happy to carry sufficient food and water for as much as four (or more) days together with the necessary clothing and overnight gear required to complete a mountain walk of this nature. 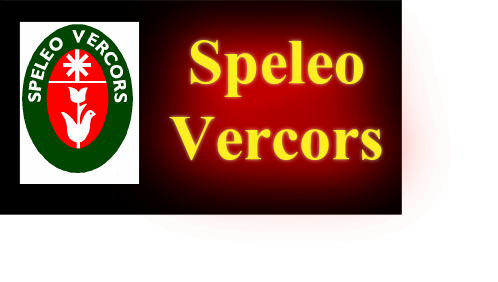 The basic information provided below should be read in conjunction with the 1:25000 map of the route; IGN 3236OT Villard-de-Lans. 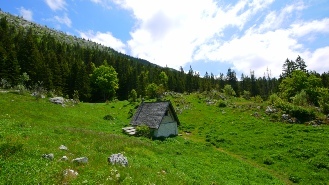 The walk commences at about 1150m asl and ascends to over 1600m asl and even in the summer, nights can be very cold. 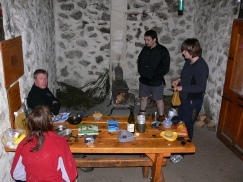 There are a number of additional walks that can be included based on each refuge, and these are mentioned briefly in the description of the route. The route is described in stages - from refuge to refuge. Transport to the start and finish of the walk needs to be considered and although there are points along the route where a descent from the plateau is possible (none of which should be considered an easy escape route) there is no good option for an early bail out! 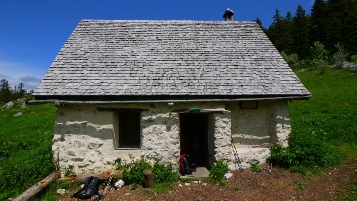 Stage 1: Correncon to Cabane de Carrette (1355m). The traverse starts at the car park next to Correncon Golf Club. GR91 is well sign posted and initially follows the immaculately manicured fairways of the golf course into the forest. 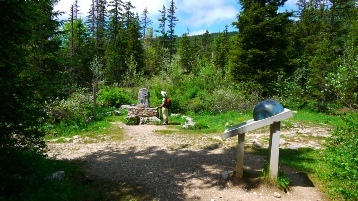 After about an hour the monument indicating the 45th parallel is reached, beyond which is a short steep section up onto the plateau (with superb views). The path continues in the forest for about another half an hour until a clearing is reached. 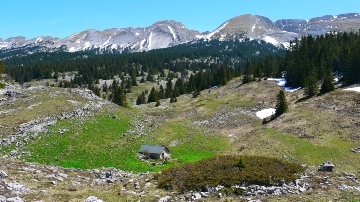 Cabane de Carrette can be found in a small sheltered depression to the left (west). Allow between an hour and a half and two hours for this section. The refuge could sleep 10 people at a push and there is no water available in the area. Walks from the refuge - Rocher du Playnet: Immediately to the west of the refuge is a vague path entering the trees. The path ascends steeply to le Grand Pot (1673M - see image above) and then becomes easier as it ascends the fault controlled valley to Pas Ernadent (1833m - great views). 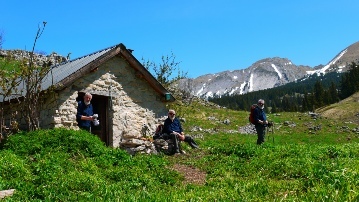 The path continues until the summit of Rocher du Playnet is reached at 1994m. 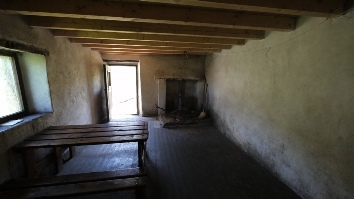 Allow four to five hours for the return trip from the refuge. 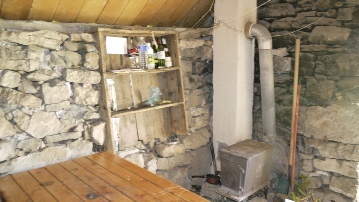 Stage 3: Cabane de Tiolache de Milleu to Cabane de Jasse du Play (1610m). Continuing roughly SE on GR91, the path ascends steeply to over 1600m (the path is quite vague in places and it is essential to follow the cairns). The path eventually levels out and heads south, mostly walking on bed rock with superb views of the east ridge and the Grand Veymont. In places the path can be vague, but it is well marked with cairns and red and white paint marks. 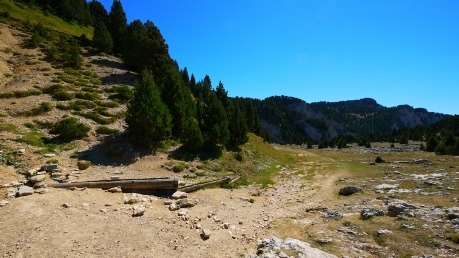 After a high point of 1642m, the path descends into a shallow valley to meet the Sentier Central path coming up from St. Agnan - turn left (east) at the junction marked by a large cairn. The path continues gently climbing up the south side of the wooded valley until at around 1600m, it pops out onto the high plateau with glorious views in all directions. 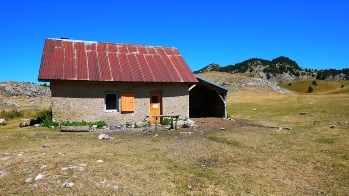 Cabane de Jasse du Play is just 10 minutes from here, located in a large, sheltered depression.The refuge will sleep 10 people and an intermittent water supply (Fountaine du Play - 1670m marked on the map) can be located about 20 minutes away in a SE direction. Allow about two hours for this section. 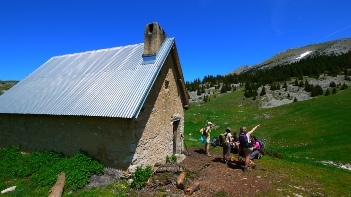 Walks from the refuge - Rocher de Seguret: On the horizon, immediately to the east of the refuge will be seen Pas de Berrieves (1850m). 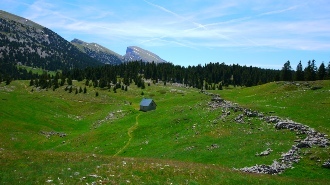 From the refuge, an obvious path gently zig zags up to the pass, and from here, a short steep section leads to the summit of Rocher de Seguret (2051m). 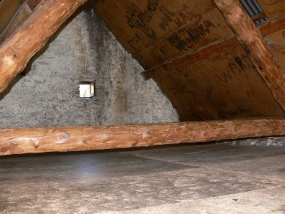 Allow about four hours for the round trip from the refuge. 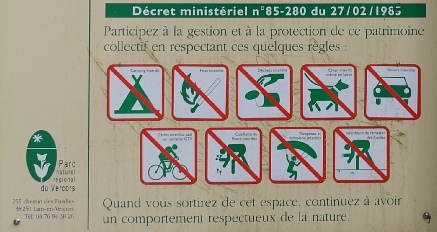 The following are absolutely forbidden on the Vercors High Plateau and if caught, miscreants are apparently subject to financial penalties; wild camping, lighting fires (apart from in a refuge), leaving litter, dogs, motor vehicles, bikes (including mountain bikes), collecting fossils, parapenting and collecting wild flowers. 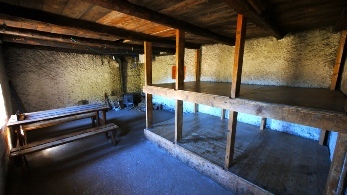 Stage 4: Cabane de Jasse du Play to Cabane de Pre Peyret (1590m). Arguably the finest section of the traverse, the plateau is now wider and seems more open, the path skirting the base of the Grand Veymont. 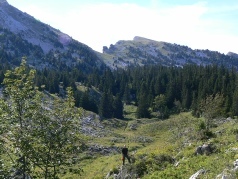 From the refuge, GR91 continues in a southerly direction, undulating across classic karst scenery. It passes two bergerie’s, the first, Nouvelle Jasse de la Chau located at the junction with Route Forestierre de Combau (the main route from the road head at Forestierre de la Coche to the Grand Veymont) before briefly entering the welcome shade of the forest. 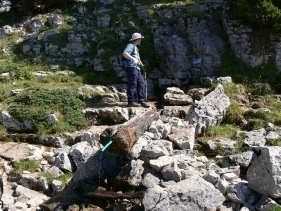 Just before the path enters an obvious clearing, located at 1670m, is the intermittent source of Fountaine des Serrons. The path now swings to the SW and eventually passes the second bergerie, la Grande Cabane (it is recommended not to bother the shepherds or their sheep, or in fact their seemingly mad, white, sheepdogs). 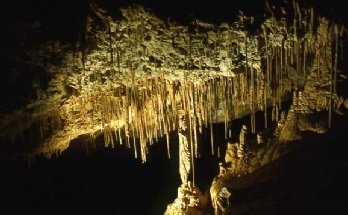 There is an intermittent source 2 km to the NW of la Grande Cabane, located at the bergerie Gerland. 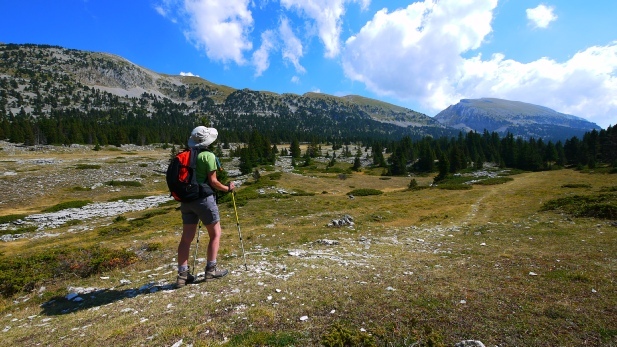 The path continues south, initially in trees before breaking out into more spectacular scenery (with views across to the Montagne du Glandasse and the Dent de Die) until dropping down into a sheltered valley to the Cabane de Pre Peyret. 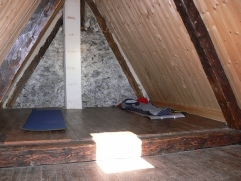 The refuge will sleep 15 people and there is a intermittent source (Fountaine des Endettes) 150m to the south of the refuge. Allow four to five hours for this section.